Bats, they are sick. I cannot hit curveball. Straightball I hit it very much. Curveball, bats are afraid. I ask Jobu to come, take fear from bats. I offer him cigar, rum. He will come. Every baseball fan is familiar with the Pedro Cerrano archetype: the hard-hitting batter who blasts fastballs into the next county but whose knees turn to jelly when the pitcher snaps off a breaking ball. I caught part of Major League while flipping through the channels the other day and I began to wonder, who in the majors today most resembles the Cleveland Indians’ Jobu-worshipping, cigar-smoking slugger? The Chicago Cubs dominate this list, with half of the team’s Opening Day lineup making the squad. Soriano has been in a class all his own. He’s killing fastballs but whiffing so often against curveballs (25.6 percent, 11.6 percent MLB average) and sliders (20.9 percent, 13.6 percent MLB average) that he could solve the world’s energy crisis with wind power. 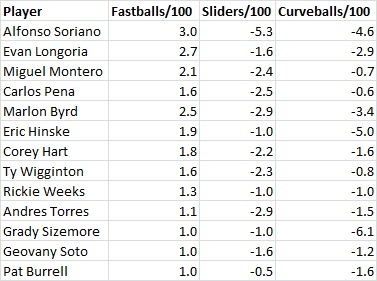 On a related note, pitchers are throwing Soriano fastballs just under 48 percent of the time this season (one of the 10 lowest rates in the majors) and the Cubs have seen the second-lowest percentage of fastballs among MLB teams. The Brewers and Giants also have two representatives on the Cerrano All-Star Team. Fittingly, Cleveland’s Grady Sizemore has the worst run value against curveballs among MLB hitters with 150+ plate appearances. So there you have it: Alfonso Soriano, captain of the Pedro Cerrano All-Stars. No word on whether any of these guys offered Jobu some Macanudos or Bacardi. We hoped you liked reading The Pedro Cerrano All-Stars by David Golebiewski! Never ever ever throw a fastball to Soriano. Ever.